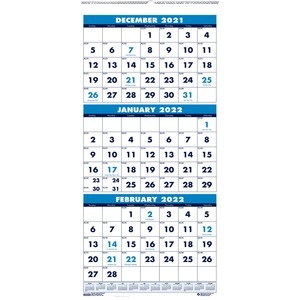 Three-month wall calendar is the perfect size for cubicle areas. Design is vertical and compact so you can hang it in space-limited areas. Dated planning pages range 14 months from December to January. Each page features three months in equal size - previous, current and future. This one-page-per-three-month format includes two-color printing, large numbers that can be seen from a distance, unruled daily blocks (1-1/6"" x 1""), holidays highlighted in teal, Sunday-through-Saturday scheduling, and a full-year reference calendar at the bottom. Wire binding and calendar pages contain a high percentage of post-consumer recycled material.